FRIEDRICHSHAFEN, Germany — Equipment and technology supplier ZF showcased a hybrid-electric version of a heavy-duty automated transmission along with all-electric steering and power options that the company said will help commercial fleets meet growing global demand for cleaner operations and better fuel economy. The Traxon hybrid-electric transmission allows diesel-powered heavy-duty trucks the ability to operate in all-electric mode via an electric motor mounted between the engine and transmission. 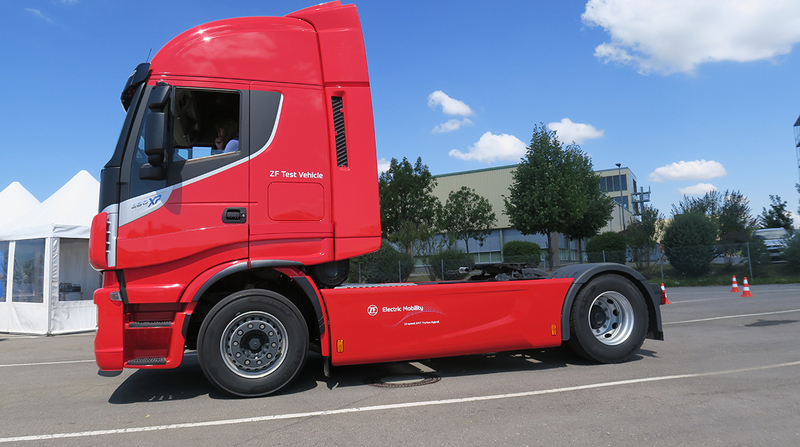 Built from the Traxon automated transmission the company introduced in 2015, the all-electric capability of the hybrid version will help fleets comply with toughening clear air standards in cities and also cut down on fuel consumption, said Dietmar Mayer, ZF’s director of sales for truck and van driveline technologies. Mayer spoke during a wide-ranging media event here in the company’s hometown during which company representatives discussed next-generation mobility initiatives ZF is developing. “This is the functionality which can provide you that last mile emissions-free,” he said of the transmission. “On top of that, there must be a good business case, and that is the fuel economy.” The hybrid module also can work as a generator and supply power to other systems on the truck, such as refrigeration units. During a test drive on a short track, the system switched easily between electric and diesel power. While Mayer noted that driver control of the system is a possibility, it would be up to truck manufacturers who ultimately offer the unit — which still is under development — to decide how, or if, to deploy that option. Mayer also pointed out that the transmission is not a stand-alone solution. In order for all-electric mode to work, systems such as steering and other accessories that normally draw power from the engine also must be electrified. “It’s a lot more than just putting a hybrid module on a transmission,” he said. To that end, ZF also unveiled its Reax EPS, a prototype, fully electric steering system for commercial vehicles that does not use hydraulics found in traditional steering setups. The company also displayed its electrically powered steering (EPS) system, which is designed to support steer-by-wire applications in the future. The company also sees a big future for fully electric powertrains, introducing two systems for light- and medium-duty applications at the event. The CeTrax mid and CeTrax lite systems are designed to replace an engine and transmission with a single unit. The Cetrax mid features two electric asynchronous traction motors in a parallel design and is designed for vehicle weights of up to 38,000 pounds, ZF said. The system offers peak performance of 300 kilowatts and a two-stage transmission. In the CeTrax lite, a single electric asynchronous traction motor produces peak power performance of 150 kW through a one-speed transmission. Standard axles and axle ratios can be used in with both drives, ZF said. They are slated to reach the global market in the second half of next year.